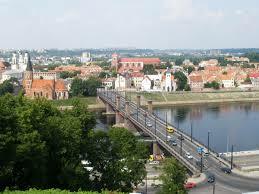 Beautiful Kaunas is Lithuania’s second largest city located on the banks of the Nemunas River. There is a lot of history to see here and a large student population making the city alive and vibrant. Of particular interest for tourists is Kaunas medieval Old Town which is found next to the confluence of two major rivers the Nemunas and the Neras. You’ll discover that Town Hall Square is surrounded by historic churches. On the south side is St. Francis Church with two towers, a college and a Jesuit monastery. Close-by you’ll find the unusual House of Perkunas built of red brick in the 16th century and stands on the site of a former temple built to the Lithuanian thunder god, Perkunas. On the bank of the Nemunas River is the Gothic Vytautas Church and to the west of the square built in the late Renaissance period Holy Trinity Church with a terracotta-roof. On the east side is the red brick Kaunas Cathedral which is the largest gothic building in Lithuania. To get a better view of it all you can climb the tower attached to the Kaunas Castle dating back to the 14th century. Nearby you’ll see the Rotuses or City Hall Square which is the heart of the city and where many city celebrations are held. At the City Hall there is a 53 m tall tower for awesome views. Lots of old houses and palaces to see some of them housing museums dedicated to particular themes such as Lithuanian literature, ceramics pharmacy, communications or sport. The main street in the Old Town is Vilniaus Street right next to the Cathedral and heads from the Rotuses Square toward the New Town. 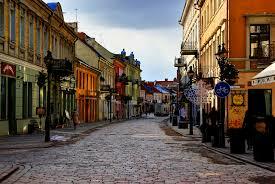 You can take a stroll back into history along the small streets found parallel to Vilniaus Street. Something really unusual is the Museum of Devils where you can see a collection of some 2000 odd devil statuettes that had been collected through the years by landscape artist Antanas Zmuidzinavicius. Here you can find out about devils in Lithuanian folklore, see spooky masks and hear funny stories. Away from the city center near the hydroelectric dam tourists will find the impressive Pazaislis Monastery that was built in the 17th – 18th centuries and counts as a pearl of late Baroque in Northern Europe. The central domed church is surrounded by other buildings thereby forming several courtyards. The grand courtyard is where the closing concerts of the annual Pazaislis Festival of classical music are held. Kaunas Reservoir is right next door and toward the north is the Kaunas Yacht Club. There is also great sunbathing and swimming at the nearby beaches found on the shores of the Reservoir in the summertime. From the monastery you can take a walk to the Petrasiunai Cemetery which is a resting place for the famous residents of Kaunas. It is divided into sections by occupation like priests, scientists, artists, sportsmen, Soviet political prisoners and so on. The Alpinist section has been created as a hill. 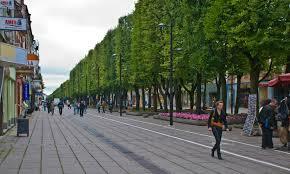 There is a lot more of interest to see and explore in Kaunas so consider it a city to visit when you travel to Europe.